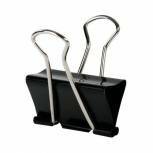 Q-Connect Foldback Clip 19mm Black (Pack of 10) KF01282 Pack of 1 Q-Connect Foldback Clips manufactured from high quality steel. Handles fold flat for space saving filing. Capacity - 19mm. 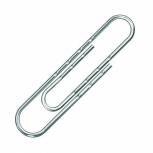 Q-Connect Paperclips Plain 32mm (Pack of 1000) KF01314Q Pack of 10 Q Connect Plain Paper Clips. 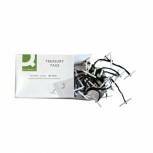 Good quality 32mm paper clips supplied in handy strong plastic hanging boxes. 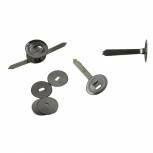 Q-Connect Foldback Clip 24mm Black (Pack of 10) KF01283 Pack of 1 Q-Connect Foldback Clips manufactured from high quality steel. Handles fold flat for space saving filing. Capacity - 24mm. 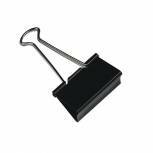 Q-Connect Foldback Clip 32mm Black (Pack of 10) KF01284 Pack of 1 Q-Connect Foldback Clips manufactured from high quality steel. Handles fold flat for space saving filing. Capacity - 32mm. 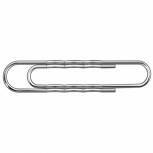 Q-Connect Paperclips Plain 32mm (Pack of 1000) KF01315 Pack of 1 Q-Connect paper clips. 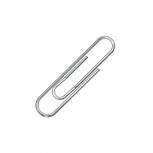 Quality large paper clips manufactured from strong, durable wire ensuring excellent gripping power. Size: 32mm. Plain. Boxed 1000s. Q-Connect 2 Piece Filing Clip (Pack of 50) KF26083 Pack of 1 Q-Connect 2 Piece Filing Clip. Simple to use 8cm 2 piece filing clip with up to 50mm (2) capacity, suitable for use with punched papers and folders. 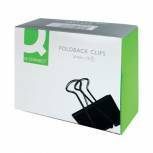 Q-Connect Foldback Clip 42mm Black (Pack of 10) KF01285 Pack of 1 Q-Connect Foldback Clips manufactured from high quality steel. Handles fold flat for space saving filing. Capacity - 42mm. Q-Connect Metal Treasury Tag 51mm (Pack of 100) KF04581 Pack of 1 Q-Connect Treasury Tags. An economical way of securely holding small or large quantities of punched papers together. Manufactured from cotton cord with metal end tags. 51mm. 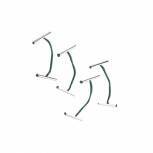 Q-Connect Foldback Clip 51mm Black (Pack of 10) KF01286 Pack of 1 Q-Connect Foldback Clips manufactured from high quality steel. Handles fold flat for space saving filing. Capacity - 51mm. Q-Connect Plastic Treasury Tag 76mm (Pack of 100) KF04572 Pack of 1 Q-Connect Treasury Tags. An economical way of securely holding small or large quantities of punched papers together. Manufactured from cotton cord with plastic end tags. 76mm. 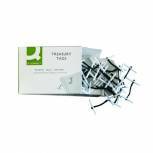 Paper Binders with Washers 38mm (Pack of 200) 36331 Pack of 1 Paper Binders. A traditional product for securing and filing papers. 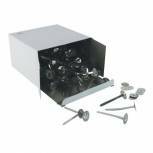 Features pointed ends for piercing paper if required and a large head and washer. Capacity - 38mm. Paper Binders with Washers 51mm (Pack of 200) 36341 Pack of 1 Paper Binders. A traditional product for securing and filing papers. Features pointed ends for piercing paper if required and a large head and washer. Capacity - 51mm. 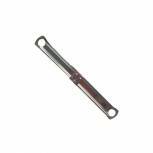 Q-Connect Metal Treasury Tag 76mm (Pack of 100) KF04582 Pack of 1 Q-Connect Treasury Tags. An economical way of securely holding small or large quantities of punched papers together. Manufactured from cotton cord with metal end tags. 76mm. Q-Connect Plastic Treasury Tag 25mm (Pack of 100) KF04570 Pack of 1 Q-Connect Treasury Tags. An economical way of securely holding small or large quantities of punched papers together. Manufactured from cotton cord with plastic end tags. 25mm. Q-Connect Plastic Treasury Tag 51mm (Pack of 100) KF04571 Pack of 1 Q-Connect Treasury Tags. An economical way of securely holding small or large quantities of punched papers together. 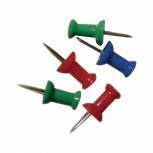 Manufactured from cotton cord with plastic end tags. 51mm. 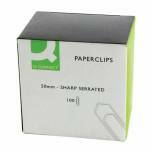 Q-Connect Paperclips Lipped 32mm (Pack of 1000) KF01317 Pack of 1 Q-Connect paper clips. Quality large paper clips manufactured from strong, durable wire ensuring excellent gripping power. Size: 32mm. Lipped. Boxed 1000s. 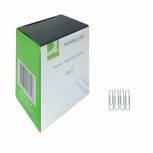 Paperclips Giant Wavy 73mm (Pack of 100) 32501 Pack of 1 Keep your papers organised and together. Slip on and off documents effortlessly for great flexibility. Strong, bent wire is durable and long lasting. Great, temporary organisation solution. Pack of 100.